Item #0688: Elite Green Protein is a 100% raw, whole food protein with all of the critical co-factors still intact (vitamins, minerals, phytonutrients) that create unmatched results for workouts and for extraordinary health (with phytonutrient benefits way beyond all isolated proteins). Suggested Use: Start with 1 teaspoon per day and increase gradually over two weeks to suggested usage of 1 to preferably 2 (or more) heaping tablespoons per day, either all at once or divided. 3 teaspoons per day equals approximately an 85-day supply. Do not take so much that you find it unpalatable, as you will end up taking and benefiting less! Mix into purified water. Drink consciously and with positive intent. Can also mix with fresh vegetable juices, fresh fruit juices (alone or blended with whole fruits and/or a banana into a smoothie). Mixing with carrot juice may produce gas. Add 1-2 tablespoons of freshly ground flax and/or chia seeds for extra nutrition. Can also be sprinkled on or mixed with foods. 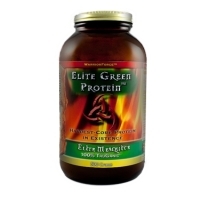 Elite Green Protein contains an extremely potent and comprehensive array of nature's most nutritive and cleansing superfoods, specifically grown and processed to maximize their benefits. If you experience temporary beneficial cleansing reactions that you find undesirable (such as loose bowels), reduce amount used to 1 teaspoon or less, and then increase over several days or weeks to 2 (or more) heaping tablespoons. Refrigeration is not required. Intensive Use: 6 or more heaping tablespoons per day. Elite Green Protein is food. It is not a supplement. It is a bio-compatible nutritional superfood. It is non-toxic and can be taken in any reasonable quantity. California Proposition 65 WARNING: This product contains lead, and other chemicals known to the State of California to cause birth defects or other reproductive harm.